From 15th-18th June , 2012 AMAN Trust in collaboration with All India Kachra Shramik Mahasangh displayed a photo exhibition on the everyday life of waste pickers of Delhi and issues concerning them. 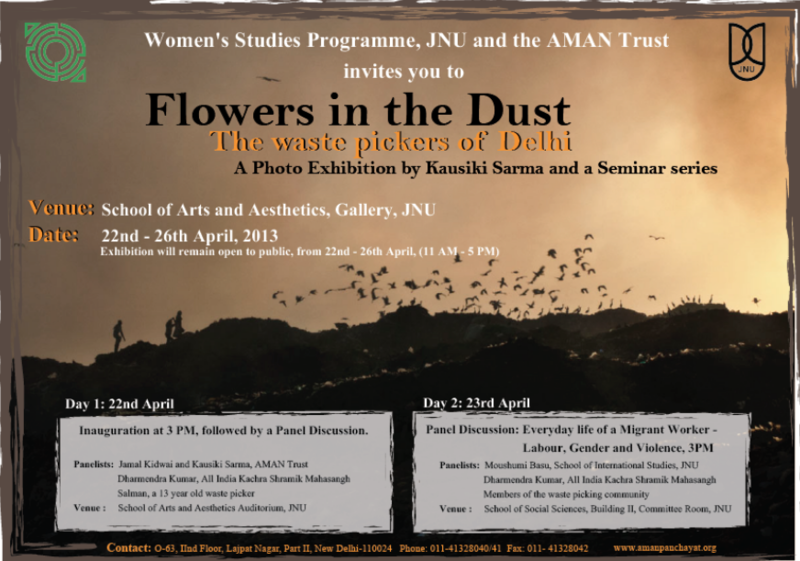 The exhibition was titled “ Flowers in the dust” and was held at the India International Centre Annexe. The photographs were shot by AMAN’s photographer, Kausiki Sarma and are from two slums of Shahbad Daulatpur near Rohini and Massoodpur near Vasant Kunj. This was a first of its kind photo exhibition to be ever held on the subject of waste-pickers. Waste pickers, scavengers or rag pickers make a living by collecting waste and selling recyclable materials out of it. They belong to the bottom rung of working population, and live in sub standard and inhuman conditions. Unhygienic working conditions take a toll on their health. Without hazard-protection equipment such as masks, gloves or boots, they rummage through putrefying waste, come in direct contact with toxic material and acquire respiratory and gastro-intestinal infections. Moreover, waste pickers face harassment on a daily basis from police men, municipal authorities and private contractors. The move by the Delhi government to privatize waste picking and set up (proposed) waste-to-energy incinerators in the Delhi has threatened their livelihood without giving them alternative means of livelihood. Most waste-pickers in Delhi happen to be migrant laborers from Bengal, Bihar, Assam or Uttar Pradesh. Many happen to be members of the minority community. A study conducted by the National Labour Institute (NLI) in 1997-98 found waste picking to be the fourth largest occupation for street children in Delhi. Most children start picking waste as a family occupation and help their parents collect, segregate and sell waste. As mentioned, toxic working conditions expose them to various kinds of diseases and affect their physical and mental growth. The majority of these children have either dropped out of or have never been to a school. Unhygienic working and living conditions also affect women. Girls are often married at a very young age and bear many children which take a toll on their physical and mental health. Due to lack of medical facilities in the slum , most deliveries are often done at home. Waste picking is not an officially recognized profession, and hence waste pickers are not entitled to any benefits or social security. Another cause of concern is the overflowing landfills. Delhi’s three landfills have long exhausted its capacity for many years but is still used to dump waste.Even though waste pickers play a significant role in the process of waste disposal, issues related to their health and livelihood remain un-addressed. Raising public awareness about the social and environmental aspects of waste management is a pre-condition for better living conditions and basic rights for waste pickers, whose jobs deserve government recognition, regulation and the protection of appropriate labour laws. Instead of promoting waste policies solely with an eye to energy sources, the recycling of waste and and the placement of subsidies on recycled goods should also be considered as options. This will help safeguard the livelihood of waste pickers. To advocate and sensitize the members of the civil society, government, political parties and individuals, media and the larger public of the sub-standard and sometimes inhuman living conditions of the waste pickers in Delhi. They constitute a population of over 3 lakhs and constitute a large section of informal labour of Delhi. To highlight the occupational hazards experienced by the waste-pickers, like extremely unhygienic and dismal working conditions and the impact of this on their health. Many of them suffer from respiratory and gastro-intestinal ailments. To expose the regular harassment and extortion the waste-pickers face from both the police and the municipal authorities and how they are deprived of basic civic and fundamental rights. To debate the move by the Delhi government to privatize waste picking and the setting up of the proposed waste-to-energy incinerators in the Delhi. Waste-pickers believe that this move threatens their livelihood as it will lead to unemployment and displacement. To highlight the large numbers of child labourers who earn their livelihood through waste-picking. As a result they are not only deprived of education but also are highly vulnerable to all kinds of illnesses associated with unhygienic conditions of waste-picking. The exhibition was inaugurated on the 15th at 6 PM, by 13 year old Salman , who himself is a waste picker. Salman’s photograph was the first in display. Every morning at six o’clock he goes to collect waste from Sector 18, Rohini and helps his uncles and aunts in the process of collecting, segregating and selling recyclable waste. His father is an alcoholic whom his mother abandoned. He now lives with his maternal grandparents along with his mother, three younger brothers and numerous uncles, aunts and cousins. His grandfather Oiinul Kazi who is 60-year old who migrated to Delhi from Birbhoom district of West Bengal 35 years back, looking for work opportunities. He has been living in the slum at Shahbad dairy since the past 15 years and indulging in the business of waste picking. Oinul Kazi and about 15 of his co – workers and neighbours came for the inauguration. Jamal Kidwai, the director of AMAN Trust gave the opening speech after which Dharmendra Yadav, General Secretary of All India Kachra Shramik Mahasangh spoke in detail about the issues concerning waste and waste pickers in general. Hanopha Bibi, who is the resident midwife of Shahbad Daulatpur also spoke in brief on the problems faced by women in the slum. The opening witnessed a presence of around hundred guests, friends and well wishers. The overall turn out of guests throughout the four days was close to two hundred. AMAN plans to take this exhibition across universities starting with the University of Delhi, Jamia Millia Islamia and the JNU. They are willing to exhibit it in any public platform, like your neigbourhood RWA, community halls and other such places through which they can sensitize and educate the masses about the problems and issues concerning waste pickers. Discussions and seminars on the theme of waste-picking and informal labour are also in the agenda.